U.S. Pavement Services, Inc. is proud to announce that the company has been chosen as one of America’s Top Contractors by Pavement Maintenance and Reconstruction Magazine. For 2013, U.S. Pavement Services has been listed as a Top Contractor for three (3) different award categories: Sealcoating, Line Striping, and Paving. Pavement Maintenance and Reconstruction Magazine is the leading industry publication for the paving, sealcoating, pavement marking, and sweeping industries by providing news and “how-to” information to assist contractors run their businesses more efficiently. 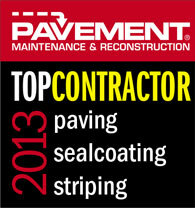 As such, this list represents a strong snapshot of the largest and most successful pavement contractors in the nation. The list is based purely on sales volume by category, and U.S. Pavement Services’ placement among the Top contractors after twenty eight (28) years in business is a testament to their success and longevity.